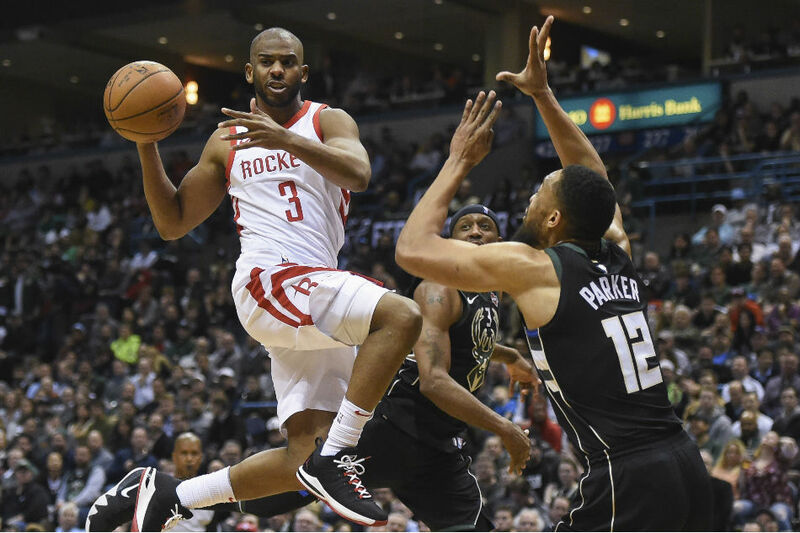 Chris Paul converted a spin move in the paint to help stave off a rally and the Houston Rockets extended their winning streak to 17 games with a 110-99 victory over the Milwaukee Bucks on Wednesday at BMO Harris Bradley Center. With the Bucks riding a 7-0 run that cut the Houston lead to five points, Paul made a short jumper over Jason Terry to reestablish control. After an empty possession by Milwaukee, Paul sank two free throws to seal the win. Paul finished with 16 points and 11 assists as Houston pulled within five victories of matching the franchise record for consecutive wins set in 2008. James Harden tallied 26 points while Eric Gordon added 18 off the bench for the Rockets, who extended to a 16-point lead early in the second half before Giannis Antetokounmpo caught fire. Antetokounmpo scored 16 of his 30 points in the third quarter, singlehandedly bringing the Bucks to within four points. But Gordon followed with consecutive 3-pointers before P.J. Tucker added a third trey, and the Rockets reclaimed a double-digit lead at 87-76 entering the fourth. Khris Middleton scored 18 points for Milwaukee, which shot just 9-of-28 on 3-point attempts. BLOG: Thoughts on Nance Jr. in Cavs starting five? One night after committing 21 turnovers in a victory at Oklahoma City, the Rockets were again reckless with the ball and guilty of seven first-quarter turnovers against the Bucks, with Milwaukee turning those miscues into 10 points. The turnovers offset in part a strong shooting effort by the Rockets (10 for 19), who nevertheless carried a 24-22 lead into the second period. But with greater ball security in the second period (two turnovers), the Rockets found greater offensive efficiency. When Paul scored following a curl at the elbow, Houston led 40-31 midway through the frame. Milwaukee answered with a bit of a flurry, cutting the deficit to three, before Harden carried the Rockets into the break with another burst of spectacular offense. Over the final 2:30, Harden tallied a 3, a dunk, and four free throws before drilling a 26-footer at the final buzzer to extend the Houston advantage to 58-46. Harden tallied 21 in the half.